Culture & Society Blog: Trump Takes Obstruction Of Justice To A Whole New Level! Trump ordered the Russia docs declassified in the middle of an investigation. This takes Obstruction of Justice to a new level and has been inspired by Fox News propagandists (which is left out of corporate media for some reason... in fact, corporate media has consistently failed to report on Fox News lies and deceptions like they have some sort of free pass to deceive the people!). On September 17, President Donald Trump ordered the declassification and public release of sensitive classified documents and text messages related to the origin of the investigation into Russian interference in the 2016 presidential election. For weeks leading up to the president’s decision, two of his informal and most-trusted cable television advisers, Sean Hannity and Lou Dobbs, clamored for the release of the material. Hannity even appeared to have gotten some early notice of the move, saying just days before Trump’s decision to declassify the material, “We expect next week, we might get those unredacted FISA warrants.” Read more. The president frequently tweets criticism of the Justice Department’s handling of the Russia investigation-- and specifically the Page FISA warrant and Ohr's role in the probe -- in response to commentary he sees on Fox. Trump declassifies Russia investigation docs, security be damned Senator Richard Blumenthal talks with Rachel Maddow about the threat to U.S. intelligence sources and methods posed by Donald Trump's declassifying documents in the ongoing Trump Russia investigation. 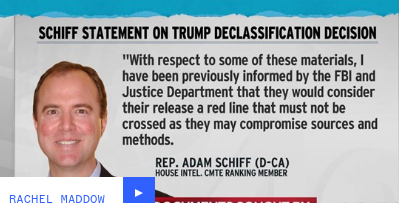 Schiff reacts to Trump order to release Russia documents In an unprecedented move, Trump ordered the FBI and DOJ to release classified information about the ongoing Russia probe. Top Democrat on the House Intelligence Committee, Rep. Adam Schiff, tells Lawrence that this helps Trump's own defense and the FBI needs to stand up and say no to Trump.